Beautiful 3/2.5/2 home on conservation and pond! Beautiful 3/2.5/2 home situated on a wonderful conservation lot overlooking pond. Cul-de-sac location offers privacy and no thru traffic. Upgraded interior features exquisite hardwood flooring and Spanish Lace finish on the walls. The home's exterior features Cement Siding which is maintenance free for the life of the home and 3M film on the windows -- very energy efficient! Light and bright kitchen with eating area. Fantastic master suite large bedroom w/walk in closet and beautiful view and large bathroom w/garden tub, separate shower and double sinks. Enjoy the beautiful Florida weather from your screened lanai overlooking pond and conservation! Desirable gated and maintenance free community of Sterling Manor! Low maintenance fee of only $113/month! 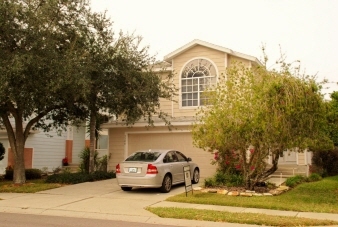 Popular Tampa Palms location with A-rated schools and easy access to shopping, dining, and I-75.